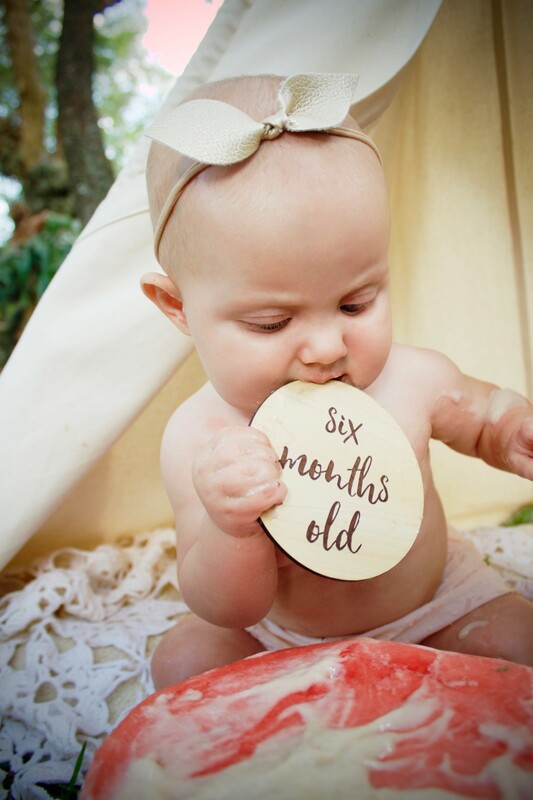 On Saturday Ava turned 6 months, yes a half year! 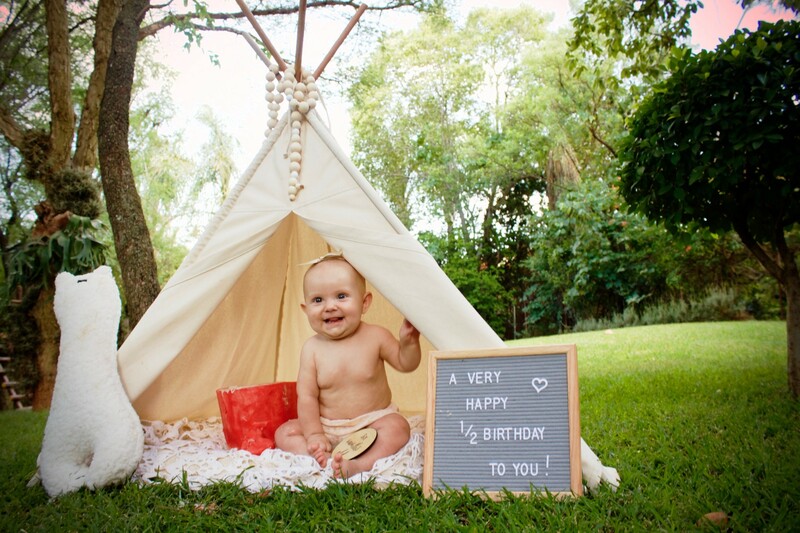 And like “good parents” we knew we had to mark the occasion with a memorable half birthday photoshoot. It’s a little tradition that in the past have always involved food seeing as 6 months was the time we introduced solids to Eliana and Lia. 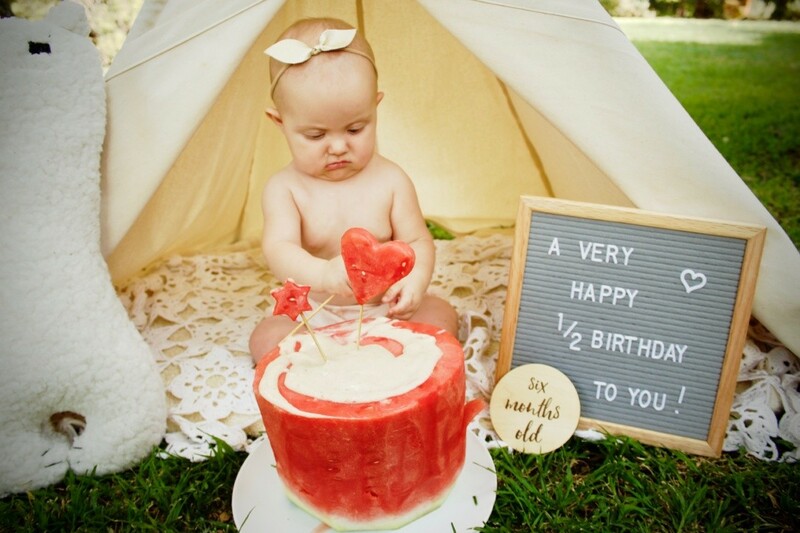 Ava has however happily been enjoying food for a month but we like the tradition and thought a watermelon cake would be clever. 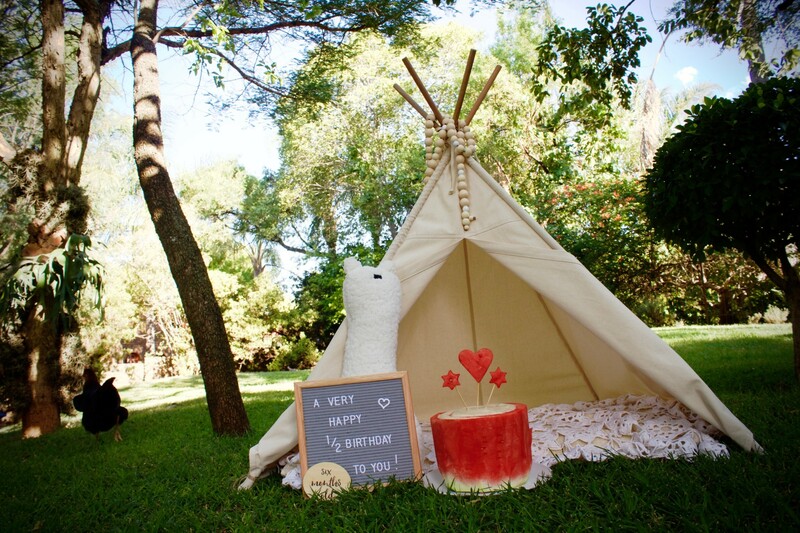 A cute little setup in our backyard with Ava’s teeny tiny baby teepee from My Tiny Teepee. 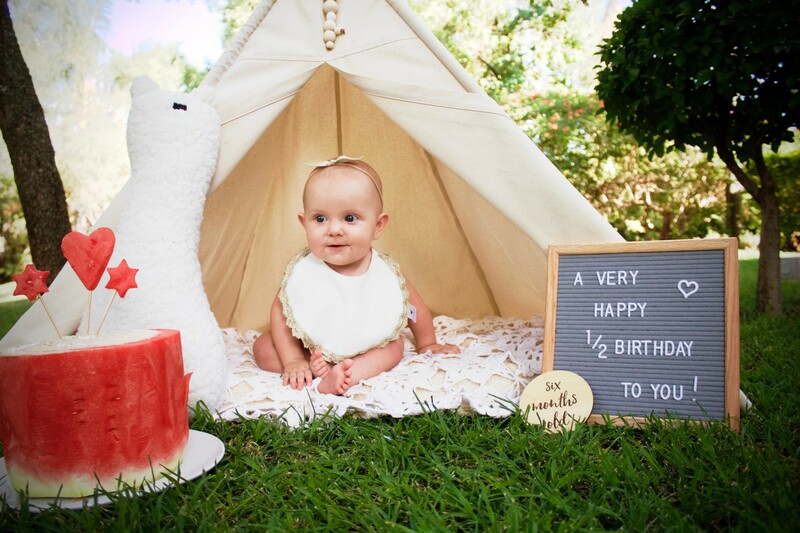 Of course Grow, Ava’s La Fédé milestone bear had to join, a garland of wooden beads by Tiger Lily Tots (for that extra touch), a Fable Lifestyle & Baby letter board and Nectar & Ink wooden monthly disc provided the perfect props to commemorated this special occasion. 2018 is also the year I have decided to work on bettering my photography skills so I would play photographer, Mr. Perfect would be my assistant and the girls would be on standby to help where need be. 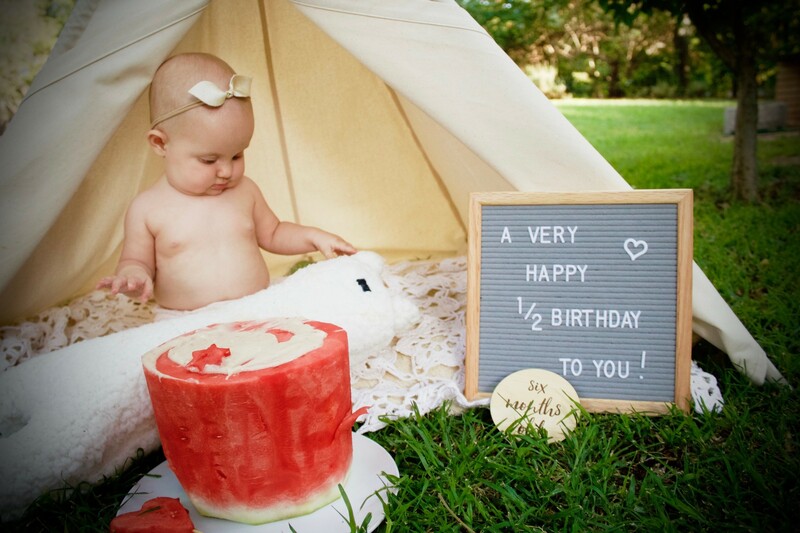 Time to add Miss Ava to her Half Birthday photoshoot! 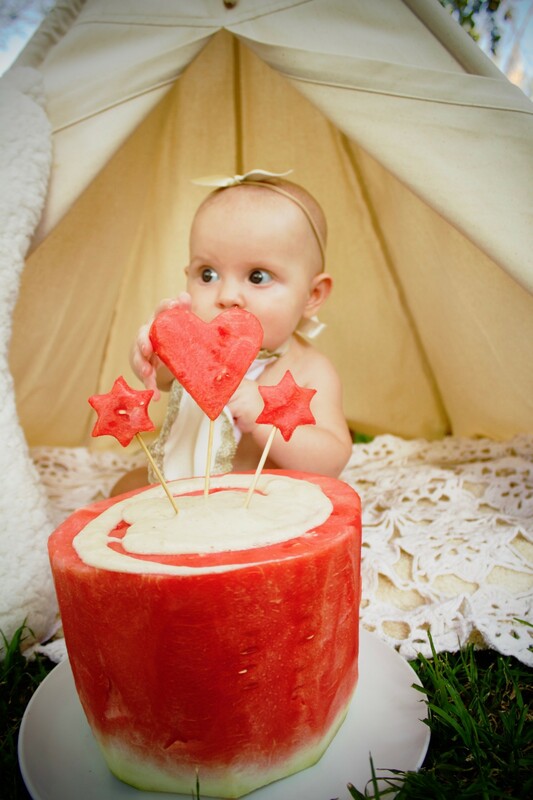 Intrigue soon turned into discuss and no matter how hard we tried, not even Grow could get Ava to enjoy some “watermelon cake”. For a moment, okay, more like a minute Ava touched and tasted the “banana frosting” (just pureed banana – usually a favourite) but that didn’t last either. Thank goodness I’m snap happy so I got these cute closeups of Ava’s little fingers and adorable toes. The photoshoot was a BUST! 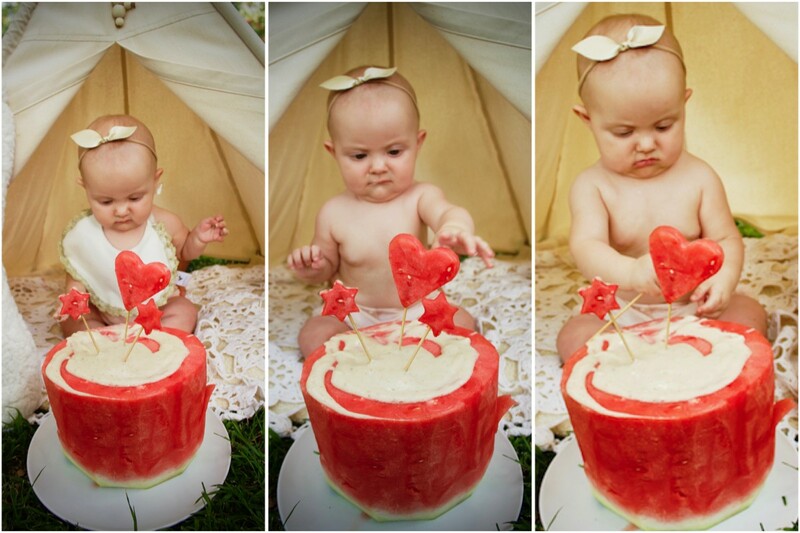 No amount of “choo-ing” or encouragement could get Ava excited about mamas carved watermelon cake. 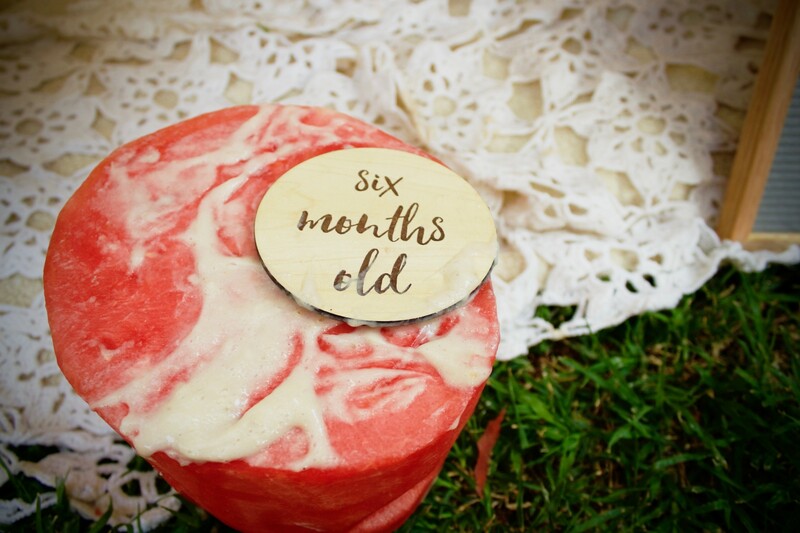 She preferred chewing on the wooden milestone disk – go figure. I had given up and moved the watermelon aside, ready to put everything away when all of a sudden a burst of joy erupted! Our little lady was shining, laughing and smiling from ear to ear. The sun even played along creating the prettiest lighting, shot after shot. 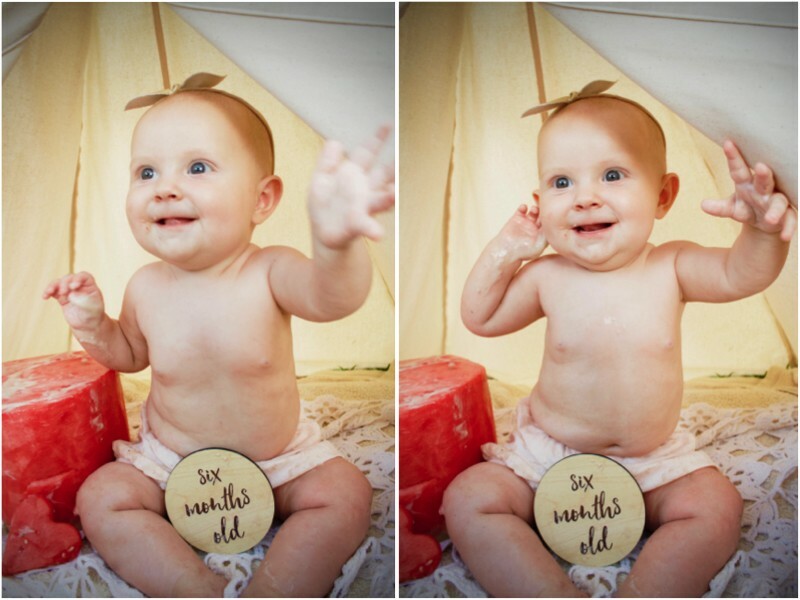 We got some adorable images that we can look back on and always remember that sometimes less is more and when you have a cute baby in front of the lens you really don’t need anything else. K.I.S.S – Keep It Simple Stupid. I think we all get why this is important to remember. Go with the flow and that flow being “whatever boss-baby prefers”. Do not try this alone. You need an extra pair of hands to help make sure your little model doesn’t fall over of gets upset. Or just someone to help draw baby’s attention away from whatever’s making them upset. Be quick. Not just in terms of the duration of the shoot but also when it comes to snapping up shots. I found taking A LOT of photos, then deleting the duds worked best. With a subject matter this unpredictable you never know when you’ll get that one perfect moment captured. Shoot in RAW. This was a tip from an Australian, blogger I love; Miss Kyree Loves. Apparently you’ll get better quality photos that are easier to edit too. The golden hour is VERY kind to amateurs. Just do it! You can only fail and your little will be 6 months old for an entire month so you can always get a pro or try again later. Do you like these pics or should I stick to writing? 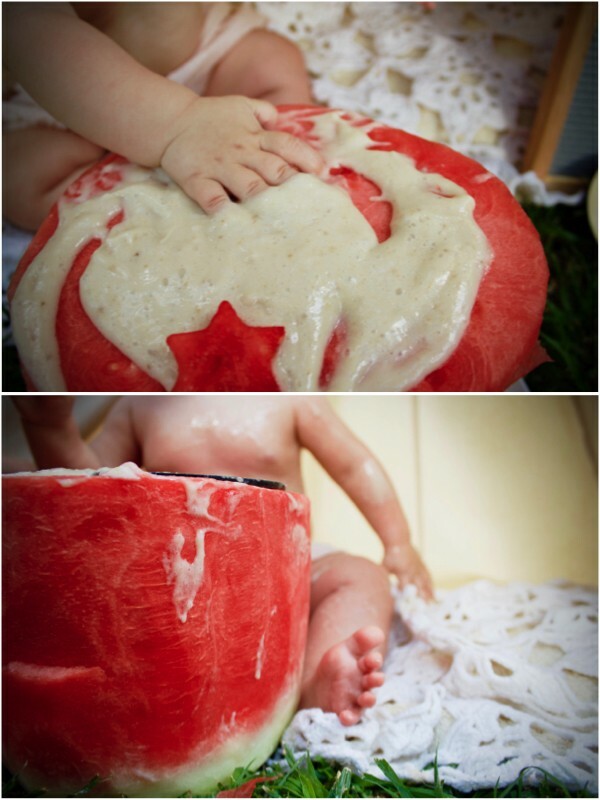 Any tips from other mamarazzi or professionals? Please share in the comments below. I’d love to hear your opinion and learn from you as well. PHOTO CREDIT | Her Mamma! Whoop- whoop! More of Ava’s look: Pretty knotted leatherette headband by Mia Mae. 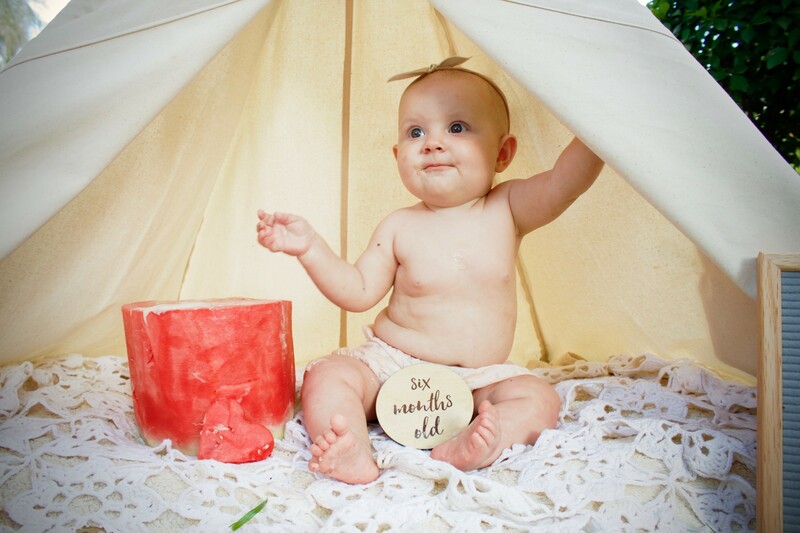 Comfy bloomer by Just Chillin’ Baby & Kids Fashion. Beautiful fancy bib from another favourite local mama-maker By Roeline & Co.
Well done mama.I think you did so well. Love the photos.